Akila Kumar grew up in Chennai, India. She has an undergraduate degree in Economics from Ethiraj College (Chennai) and a Masters in Administration from Bharathidasan Institute of Management (Trichy) and an MS in Finance from Golden Gate University (San Francisco). She moved to the USA in 1988 and has lived in the Bay Area since. She has been working in the USA since 1992 and has held jobs in product marketing, partner/alliance program management for TRW, Oracle, and Symantec among others and currently heads Strategy for Hewlett Packard Inc. She has two daughters in high school and college. Her hobbies include traveling, Isha Yoga and hiking. Seema Shah was born in Ahemdabad, Gujarat. She has a Bachelors degree in Electronics & Communication from KLS Gogte Institute of Technology, in Belagavi, Karnataka. 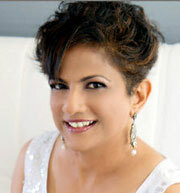 She moved to the US in 1989 and since then has run several successful retail businesses in the Bay Area. She had a couple of video stores in Santa Clara and had opened up a frozen yogurt store in downtown Sunnyvale. She is retired now. She has two daughters and a son. She enjoys traveling, being with friends and cooking. She is comfortable in Gujarati, Marathi, Hindi and English. 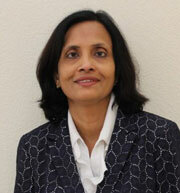 Hema is originally from Chennai, India. She has an undergraduate degree in Commerce from Ethiraj College, Chennai, and an MBA from XLRI Jamshedpur in India. 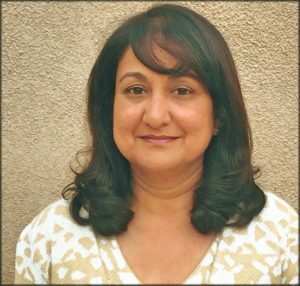 After migrating to the United States in 1990, she started her career with Applied Materials in Santa Clara, and has held roles in Finance. After several years at Applied Materials, she took a break for a few years to spend more time with the family and rejoined the workforce, heading Financial Planning and Corporate Finance for Mattson Technology. For the last six years, she has been Head of Finance for a solar Company, Sunpreme. She has a husband who is a technology leader in the cyber security space and a son who is a junior at a college in Chicago. Her hobbies include reading, movies, hiking and traveling to new places. Anoo Nathan grew up in Coimbatore and did her Engineering at PSG Tech. 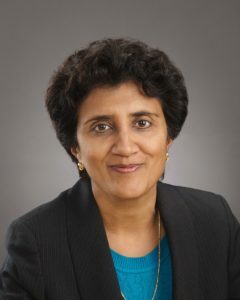 After coming to the USA in 1986 to pursue her Masters in Computer Science at Santa Clara University, she kicked off her career at Hewlett Packard as a software engineer. When the entrepreneur spirit beckoned, she left HP and managed a series of start-ups in various roles including CFO, COO and now is making in-roads in m-health as CEO of Smart Monitor that provides monitoring and tracking solutions for people with chronic health conditions. Her hobbies include running, yoga, reading and entertaining friends and family. She has a son and daughter who both attended Ivy Leagues and are pursuing successful careers of their own. 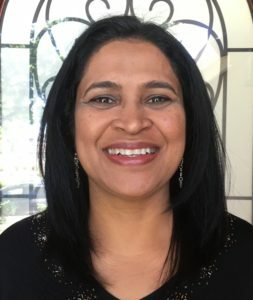 Viji Dilip, a Bay Area resident for the past 22 years, has two children, the eldest being in grad school after completing their undergrad in Biology while the younger child is currently a sophomore in college. Viji is a finance professional who works for a nonprofit and in her spare time volunteers to help people with visual impairment. Nandini Nayak is from Bangalore, India. 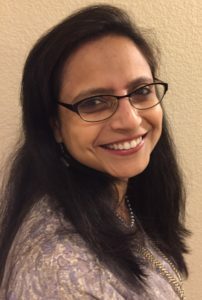 She has an undergraduate degree from Mount Carmel College, a Master’s degree in Clinical Psychology from Bangalore University, and a Ph.D. in Cognitive Psychology from the University of California. Nandini is currently a Managing Director at Accenture Digital where she specializes in digital transformation and design services. Married to a Silicon Valley entrepreneur, she has two grown-up sons. In her spare time Nandini likes to read, travel, hike, bike, cook, and socialize with family and friends. She actively supports gender equality, the advancement of women, basic literacy and economic empowerment. Jaya grew up in Delhi, India. She has an undergraduate degree in Commerce from Delhi University with an advanced degree in Interior design. She moved to the USA in 1988 and has lived in the Bay Area since. She has been involved in volunteer activities and worked for the City of San Jose for many years. She shifted her career midstream and now runs a successful interior design business. She has a son in college and daughter who recently graduated with dual degrees. Her hobbies include traveling, flea market treasure hunting, bargain shopping, and entertaining.